The Rosetta is a spacecraft built by the European Agency. It was launched on March 2, 2004. Along with Philae, its Lander performed a detailed study of comet 67P- Churyumov Gerasimenko (67P). During its journey to the comet, it flew by Mars and the asteroids 21 Lutetia and 2867 Steins. The spacecraft reached the comet on August 6, 2014, and performed a sequence of maneuvers to be captured in its path. While on November 12, its Lander section Philae performed was the first successful landing on a comet, although its battery power was low and ran out two days later. However the communications with Philae were briefly restored in June and July 2015, but due to diminishing solar power, Rosetta's communications module with the Lander was turned off on July 27, 2016. On September 30, 2016 the Rosetta finished its mission by landing on the comet in its Ma'at region. The probe is named after the Rosetta Stone, a stele of Egyptian source featuring a declaration in three scripts. While the Lander was named after the Philae obelisk, that bears a bilingual Greek and Egyptian hieroglyphic inscription. Rosetta was launched on March 2, 2004, from the Guiana Space Centre in French Guiana on an Ariane 5 rocket and it successfully landed on Comet Churyumov–Gerasimenko on August 6, 2014; which became the primary spacecraft to orbit a comet. There were many missions conducted successful flybys of seven other comets, but this was the one of ESA's Horizon 2000 keystone missions. This spacecraft consisted of the Rosetta orbiter, which featured 12 instruments, and a Philae Lander, with nine added instruments. The Rosetta mission orbited Comet Churyumov–Gerasimenko for seventeen months and was designed to complete the most thorough study of a comet ever attempted. This spacecraft was controlled by the European Space Operations Centre (ESOC), in Darmstadt, Germany. The planning for the mission of the scientific payload, jointly with the data recovery, calibration, archiving and sharing, was also performed by the European Space Astronomy Centre (ESAC), in Villanueva de la Cañada, near Madrid, Spain. It was estimated that in the decade proceeding of 2014, around 2,000 people assisted in this mission in some capacity. While in 2007, the Rosetta made a Mars gravity assist (flyby) on its way to Comet Churyumov–Gerasimenko, and also performed two asteroid flybys. The craft finished its flyby of asteroid 2867 Steins in September 2008 and 21 Lutetia in July 2010. Later on January 20, 2014, Rosetta was taken out from the 31-month hibernation mode as it approached Comet Churyumov–Gerasimenko. Rosetta's Philae Lander effectively made its first soft landing on a comet nucleus when it touched down on Comet Churyumov–Gerasimenko on November 12, 2014. On September 5, 2016, ESA announced that the Lander was exposed by the narrow-angle camera onboard Rosetta as the orbiter made a low, 2.7 km (1.7 mi) to pass over the comet; and the Lander sits on its surface wedged into a dark gap of the comet, clearing up the require of electrical power to set up proper communication with the orbiter. During the 1986 approach of Halley's Comet, many international space probes were sent to discover the comet, and most prominent amongst them being ESA's Giotto. After these probes came back with valuable scientific information, they became obvious to follow-on and were needed to shed up more light on commentary opus and answer new questions. 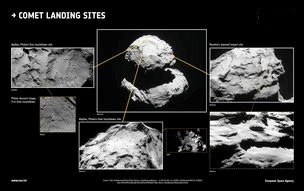 The European space Agency and NASA have started cooperatively developing new probes; among them the NASAs project was the Comet Rendezvous Asteroid Flyby (CRAF) mission and was the follow-on Comet Nucleus Sample Return (CNSR) mission by the ESA. Both missions were to share the Mariner Mark II spacecraft design, thus minimizing costs. In 1992, after NASA canceled CRAF due to budgetary limitations, ESA decided to develop a CRAF-style project on its own. By 1993 it was evident that the ambitious trial return mission was infeasible with the existing European agency budget, that is the reason the mission was redesigned and subsequently approved by the ESA, with the final journey plan similar to the canceled CRAF duty: an asteroid flyby follow by a comet rendezvous with an in-situ examination, including a Lander. After the spacecraft launch, Gerhard Schwehm was named mission manager; he retired in March 2014. We will learn more on this blog in our next part.